We have created a simple guide for Landscapers who are planning to use Wild Flowers this year. Wild flowers are growing in popularity and are now commonly seen not only in our parks and city centres but in small urban gardens and golf courses and schools. They have a wonderful informal feel and can be used within many areas for a magical display. The correct mixture for soil type and habitat is key. The make up of these mixtures are honed to provide the best species for the right places. The Grass People provide high purity seed and native varieties that are suited to UK conditions. 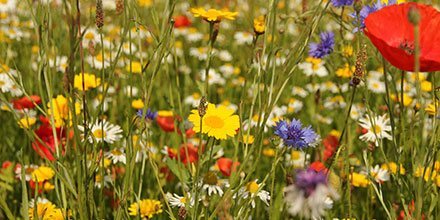 Choose this mixture for a stunning mix of wildflowers that benefit both bees and butterflies. It has both annual and perennial wildflowers alongside appropriate grass species. A lovely vibrant mixture. Great for using on urban locations or derelict sites where temporary colour is needed. A beautiful mixture that combines ornamental grasses with wild flora. This mixture can be also be sown on acid soils. This is a low maintenance mixture as the grass growth will be slow. More suited to semi shade from trees or structures, this mixture contains annuals and perennials. This mixture is for clay soils and will require careful prepping of the ground before sowing to ensure good establishment. A drought resistant mixture that is more suited to free draining and dry soil. Good for construction areas where the grasses need to provide good stable ground cover. Maintained properly in the first year - the management of wild flower mixtures is more complex due to the wider range of growth characteristics between species. Sowing in autumn also gives germination in early spring for a flora display in the summer. Mixtures which have been established during the autumn are unlikely to require cutting until the following spring. By this time there should be a sufficiently developed area of companion grasses. In most cases, wildflower mixtures should be sown at 5g/m2. It is tempting to increase the sowing rate but this will only encourage the grass cover crop to dominate the sward and inhibit wildflower establishment.